When commissioned at the New York Naval Shipyard on 9 Apr. 1941, the USS North Carolina was considered the "greatest sea weapon in the world." Built at a cost of $70 million, the new "super-dreadnought" was as long as two city blocks, as tall as a 15-story building, and 35,000 tons in weight. It held nine 16-inch guns and carried 1,800 officers and sailors. For 40 months, the ship took part in every major offensive in the South Pacific, including Guadalcanal, the Philippines Sea, Iwo Jima, and Tokyo Bay. During a battle in August 1942, an observer from another U.S. ship wrote that the North Carolina's gunfire was so heavy, "she look[ed] to be ablaze throughout." The Japanese reported on several occasions that the vessel had been sunk; this misinformation was probably due to the tactic of repainting the ship different colors. The North Carolina earned 12 battle stars and the nickname "Showboat," supposedly received when the crew of the USS Washington played the Broadway tune "Here Comes the Showboat" as a joke. In 1960 the USS North Carolina was destined for the scrap heap, sparking a statewide fund-raising campaign to save it. Citizens raised $345,000 and purchased the ship from the U.S. government. Restored to its wartime appearance, the North Carolina was permanently docked across the Cape Fear River from the city of Wilmington, opening on 14 Oct. 1962 as a memorial to North Carolinians who had died in World War II. As of the early 2000s, tours of the ship were conducted and a museum was open every day of the year. During the summer a 70-minute outdoor drama, titled The Immortal Showboat, artfully portrayed the ship's role in American naval history. 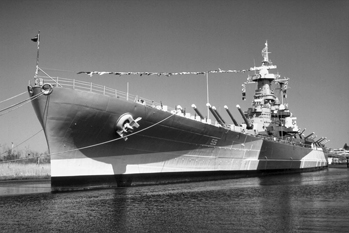 In March 1986 the USS North Carolina became one of 22 ships to be registered as a National Historic Landmark.